Did you know that July is national ice cream month? Luna and Larry of Organic Coconut Bliss understand that even people who can’t or won’t eat dairy products love ice cream, using this knowledge as the fuel for creating their company. They say, “we just wanted a tasty frozen dessert that we could enjoy eating without feeling bad afterwards” about their motivation for starting Organic Coconut Bliss. Since that time, their frozen desert brand has climbed to now be named as the #1 item on VT’s Veg 25 hot list for 2009 and is said to be not only healthy, but delicious as well. I’m very excited that Luna and Larry agreed to let me represent them during National Ice Cream Month. They sent me 3 coupons each good for a pint of Coconut Bliss, and I would have posted this Blog about them sooner but the stores near me that claimed over the Internet to carry Coconut Bliss actually don’! Unfortunately, I wasn’t able to test Coconut Bliss because of this. Now if you have the same problem, don’t worry–you can actually order their products online and they can be shipped to you through Diamond Organics. Unfortunately, nowhere can I find that you can use the coupons for free pints at Diamond Organics. Otherwise, I’d be eating Coconut Bliss right now…obviously. In the spirit of blessing others, I’m going to pass my coupons on to 3 readers. That’s right–I’m picking three winners! 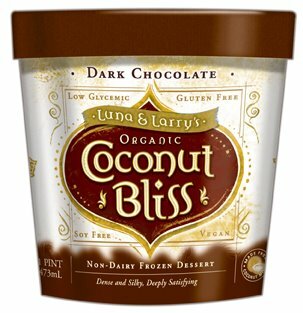 To win a coupon for a free pint of Organic Coconut Bliss, just head over to their website and tell me 1) What flavor you want, and 2) Where you can really buy it at. Please don’t enter unless you can actually get your hands on a pint! This contest is only open to US mail addresses and will end August 9th at 2359 hours, EST. Remember to include an email address and separate comment for each entry. *Otherwise telling the world about my blog and/or this post! I must have the Chocolate Hazelnut Fudge! Luckily they sell it at my local health food store: Harvest Health Foods in Grand Rapids, MI! Hi! I love your blog and your husband Ron's artwork is amazing. I used to eat Coconut Bliss, but that was before I tried Purely Decadent coconut milk ice cream. I think it's so much richer and creamier, and I like that it doesn't leave an odd aftertaste. If you like Coconut Bliss, I think you'll love Purely Decadent. MMMMM!!! At 99 degrees today and expecting over 100 the next couple days, I could really go for some Chocolate Peanut Butter Coconut Bliss right now. Good thing thing they sell it at my local Fred Meyer store. I would get the Pineapple Coconut flavor (I'm partial to fruity flavors!) and I'd buy it at my local co-op, Valley Natural Foods. Yes, they carry it as I've drooled over it before. My son and I just love thePurely Decadent Chocolate. We get it at Whole Foods in LongBeach CA. It is so good and smooth and creamy. My son has Autism and has multiple food allergies. This ice cream is heaven-sent! Chocolate Hazelnut Fudge for the win!!! I love the Dark Chocolate. I can get it at Whole Foods or Central Market HEB in Austin, TX. Yum! Oh these ice creams are so good, and healthy! My acupuncturist turned me on to them. Thanks for the chance to win one. I would love to try the Cappuccino one. I recently saw it at Whole Foods Palo Alto, CA. Our family enjoys Purely Decadent coconut milk ice cream, too. It's very rich and creamy like gelato. We like the Mint Chip and Chocolate flavors. It would be a tough decision for me between the dark chocolate and the pineapple coconut. Yum. I can get these at the Whole Foods on University Avenue in Madison, maybe 10 minutes from me. My pick would be the Naked Almond Fudge – yumm! And I can buy it at the Whole Foods right here in Kansas City. I sport both buttons on my blog! How did I miss this one?!? We can buy this at Earth Fare in Columbia, SC, I think I'll be headed there real soon! What a shame that you didn't get to try the ice cream yourself. It's so yummy! Chocolate Peanut Butter is awesome. But I've also tried Mint Galactica and Cappuccino and they are all excellent. I bought them at both Whole Foods and Harmons Grocery Store in Utah. The price was .20 more at Whole Foods and they had more flavors there.